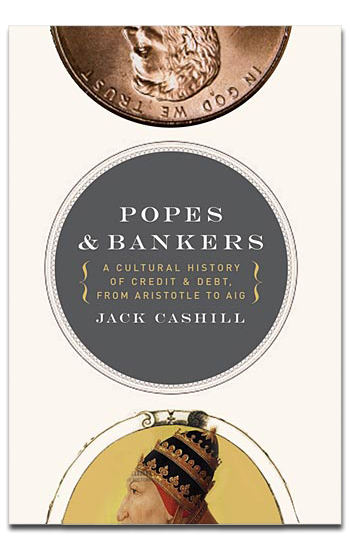 Jack Cashill's "Popes & Bankers"
In Popes & Bankers, Jack Cashill aims for a cultural history of credit and debt. Mission accomplished. While the subject material could very easily lead to a dull, dry read, Cashill isn’t trying to write an economics textbook. Rather, he offers a fact-filled chronicle of our attitude toward money throughout history. Most enlightening is Cashill’s depiction of the “predatory lending practices” that contributed to the current economic crisis in the United States. Cashill doesn’t pull any punches; he certainly acknowledges the presence of predatory lending in our marketplace. But Cashill is quick to point the finger at consumers as well, individuals whose greed and materialism propped up a reckless financial system. The current “subprime morass” (as Cashill calls it) is the product of a communal loss of of personal financial responsibility coupled with the moral corruption at high levels in the lending industry. But Cashill’s journalistic chops keep Popes & Bankers from coming off as smug and self-righteous. In fact, Cashill’s approach — delineating the perspectives on finances found in the Hebrew scriptures, the early Christian church, Aristotle, Aquinas, and Karl Marx (among many others) — gives his assessment of the current economic downturn legitimacy and credibility. This is not a sanctimonious read. One slight critique: the Biblical references in the book primarily come from the King James version. This isn’t a big deal, but I think Cashill’s text could’ve benefited from a more current translation. Nitpicking, I know; but the Elizibethean language and wooden sentence structure is sure to slow down some readers. You get the impression Cashill could write a tome on this material, yet Popes & Bankers remains a concise and accessible read. This entry was posted in Books and tagged Economic Crisis, Jack Cashill, Money, Wealth. Bookmark the permalink. i feel like it’s really odd this guy would use the king james version. i mean that’s not the sort of thing you accidentally do, or don’t really think about; there is a definite decision made when you quote the kjv. but it sounds like a good read.